Ford India has been very pro-active in drawing India’s attention towards the new Fiesta sedan, which is due for launch later this month. 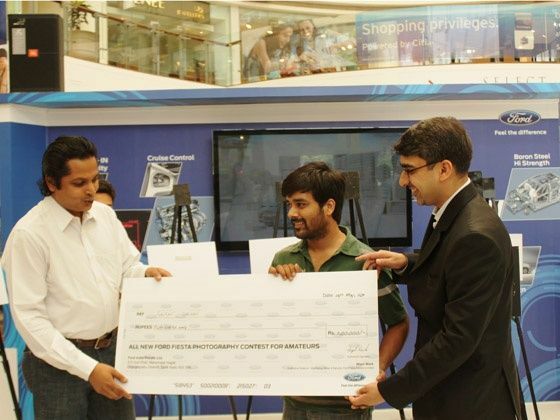 A flurry of promotional activities starting with the “All-new Fiesta Photography Contest’ was followed by the actual unveiling of the stylish new sedan at the Fiesta Café in New Delhi, both of which attracted great crowds. Just a day after announcing the results of the photography contest, in which the winner walked away with a cash prize of Rs. 2lakh, Ford India carried forward the excitement around the launch of the new Fiesta by organizing a unique fashion event, where acclaimed fashion designer Swapnil Shined presented to the crowds present a trendy line of clothing called the ‘Fiesta Futuristic Collection’, that was inspired by the flowing lines in the kinetic design of the new Fiesta. The venue for all this Fiesta mayhem has been the Fiesta Café located at the Select Citywalk Mall, Saket, New Delhi where Ford continues to find ways to connect with its customers in an abolsutely high-tech environment that engages Ford fans in the country with a high level of connectivity through iPads, interactive touch-screens and a human-gesture-controlled ‘fanwall’. This Fiesta Café, where an exhibition model of the new Fiesta is currently on display has and will continue to host other lifestyle and fashion events and video-conferencing with Ford technology experts.